Sea or lake surface temperatures are part of the algorithm used to create IFR Probability fields. The cold Great Lakes in late May are a prime location for advection fog, and IFR Probability fields will blanket the Great Lakes with high values under southerly, moist flow. It is not uncommon to see all of the Lakes bright orange/red. Note in the image above how Manitowoc WI and Charlevoix MI both have IFR Conditions. In addition, Dense Fog advisories were issued north of Milwaukee to the tip of Door County. This entry was posted in Midwest, Wisconsin on May 26, 2015 by Scott Lindstrom. 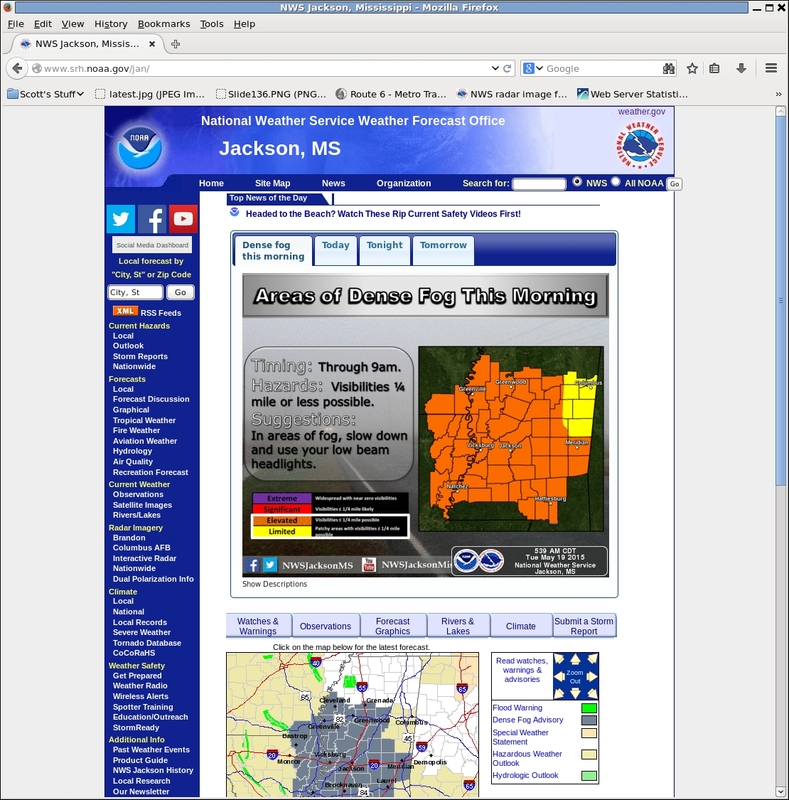 Thunderstorms moved through Mississippi (See this animation — from this Blog Post — of SRSO-R 1-minute imagery from 18 May), and the low-level moisture left behind allowed Dense Fog to form, and Dense Fog advisories were issued. 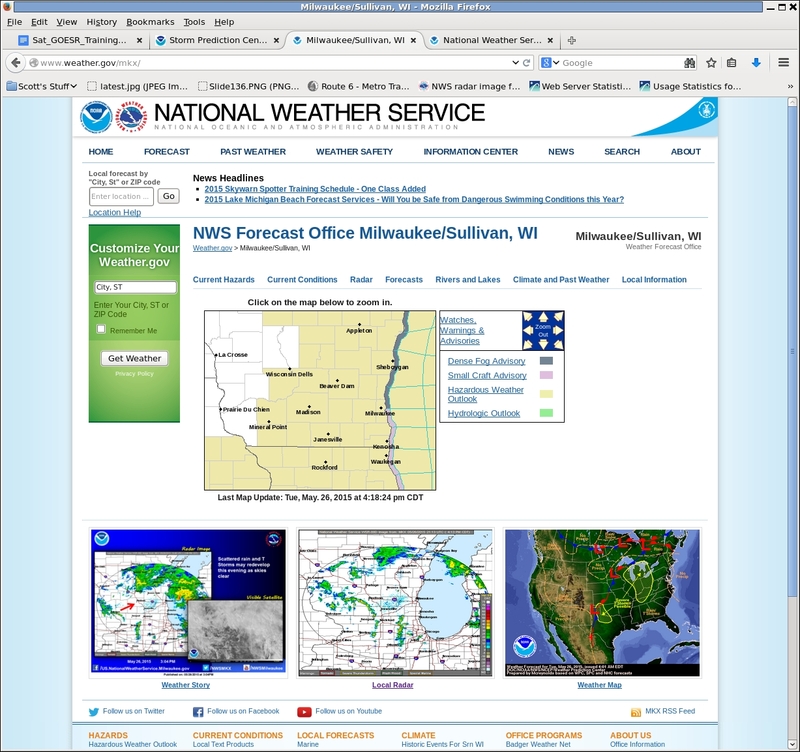 Multiple cloud decks — shown in the toggle, below, of Suomi NPP Day Night Band and Brightness Temperature Difference (11.45 µm – 3.74 µm) — prevented the traditional brightness temperature difference product from providing useful information. GOES-R IFR Probabilities, shown ~hourly in an animation above do highlight the region of developing IFR conditions. Low ceilings and reduced visibilities are commonplace in regions where IFR Probabilities are increasing over night. The predictors that are included to compute the IFR Probabilities are mostly model-based because of the multiple cloud layers that are present, and the IFR Probability field is somewhat flat as a result. Note that GOES-R IFR probabilities increase at the very end of the animation; when daytime predictors are used, probabilities are a bit higher than when nighttime predictors are used. This entry was posted in Deep South, Suomi/NPP, Uncategorized on May 19, 2015 by Scott Lindstrom. Easterly winds south of a High over the Canadian Maritimes ushered in cool, moist air over the Northeastern United States early on Monday. IFR Probabilities, above, show the progress of the low ceilings and reduced visibilities that accompanied the change in air mass. 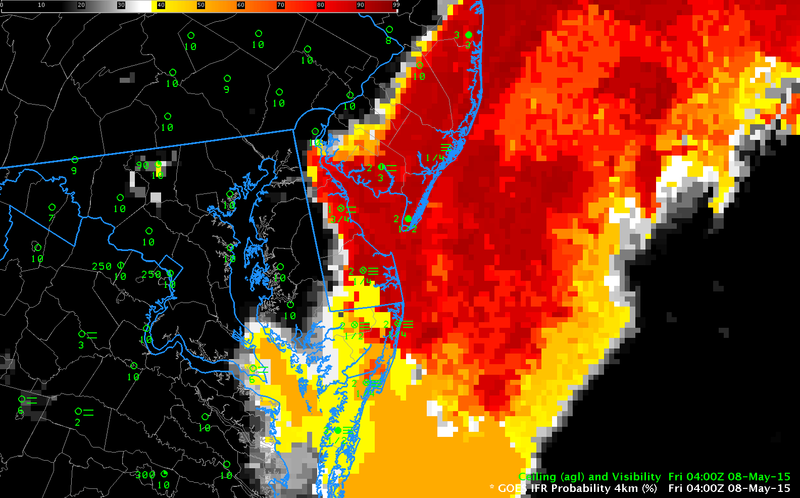 The low clouds eventually penetrated to the Delaware River, as shown in the GOES-14 SRSO-R animation here (from this blog post). In the animation above, observations of ceilings and visibilities over southern New England approach IFR conditions quickly as the IFR Probability ‘front’ passes through. This entry was posted in New England on May 18, 2015 by Scott Lindstrom. Dense Fog Advisories were issued for the northwestern part of the Florida Panhandle overnight (Link). How did various fog-alert satellite products perform for this case? The brightness temperature difference product, below, that works because clouds comprising water droplets have different emissivity properties at 3.9 µm and 10.7 µm, did not provide much guidance for this event. This is because multiple cloud layers prevented the satellite from seeing down to the developing stratus/fog deck near the surface. The cloud deck persisted over Alabama, but eroded over northwest Florida by 0700 UTC. (Click here for an animation of GOES-Sounder Cloud Heights). In addition, fog persists through sunrise, and the rising sun is emitting 3.9 µm radiation; that makes interpretation of the brightness temperature difference field problematic. 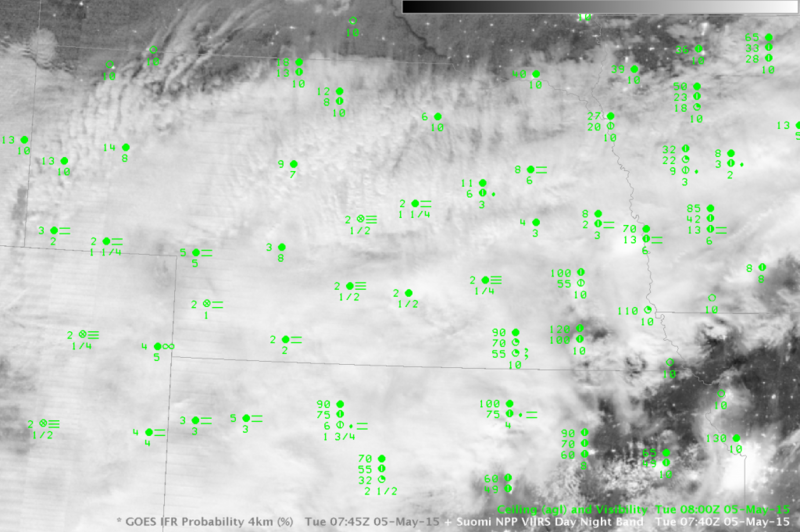 The GOES-R IFR Probability field, below, provided better information about the developing cloud field. Probabilities increase as the fog develops, and the spatial coverage of the enhanced IFR Probabilities better matches the regions where Dense Fog Advisories were issued. In addition, the strong signal persists through sunrise. 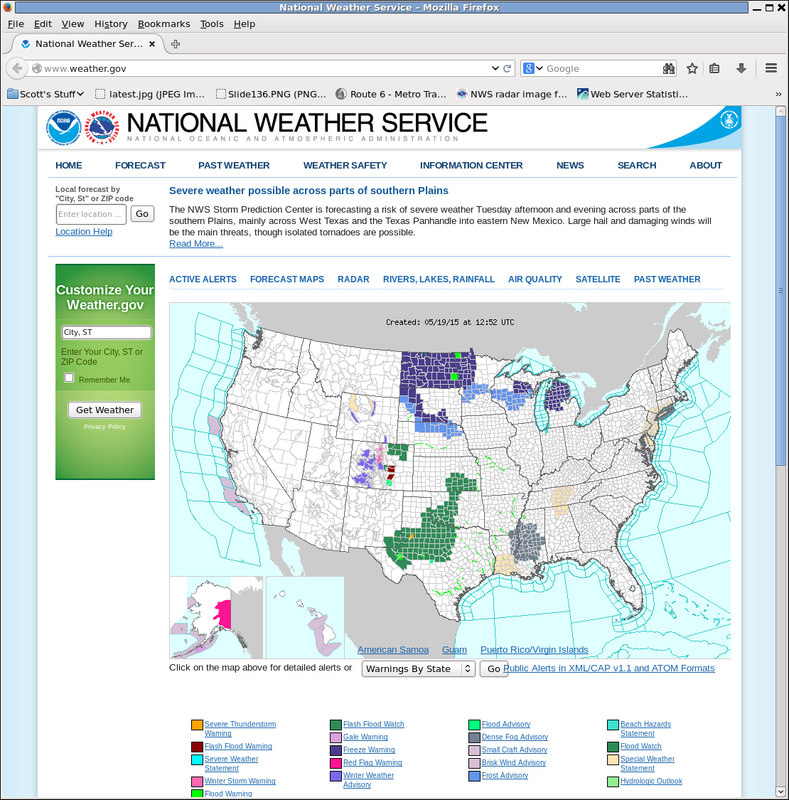 This entry was posted in Deep South on May 12, 2015 by Scott Lindstrom.